The way the lightweight division is panning out, it's looking like we could get the rubber match between Conor McGregor and Nate Diaz before the year is out. 155lbs champion Khabib Nurmagomedov is determined to sit out a full year in solidarity with his suspended teammates and the interim lightweight title will be on the line when featherweight king Max Holloway moves up to meet the streaking Dustin Poirier at UFC 236. Elsewhere in the top 15, Tony Ferguson may be out for some time as he deals with personal issues and a match-up between Donald Cerrone and Al Iaquinta has been verbally agreed. As noted by Ariel Helwani, the goings-on at lightweight could offer a clear path for McGregor vs. Diaz III. 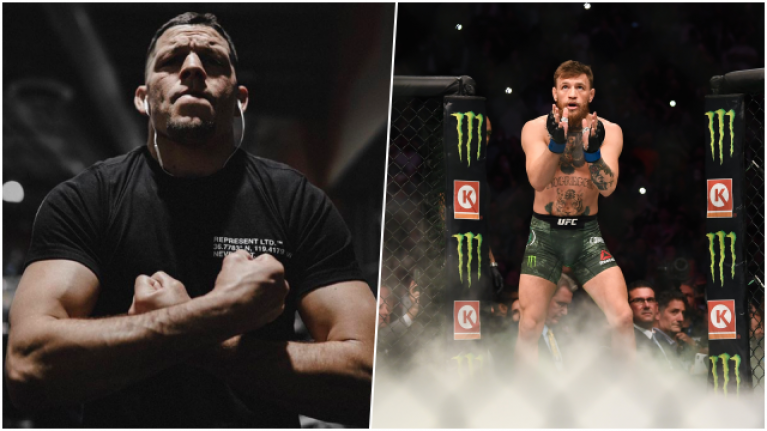 McGregor recently assured fans that the trilogy with Diaz would be completed and it would certainly make sense from the UFC's point-of-view given the financial success of their clashes at UFC 196 and UFC 202. "He fought me, he beat me. He gave me a rematch at the exact same weight, there was no hesitation, that's a true fighter right there," McGregor told TMZ Sports. The weight class at which the pair meet could prove interesting as Diaz has claimed that he is done cutting weight and suggested that he will next take to the Octagon as a middleweight. McGregor doesn't walk around anywhere close to 185lbs but weight classes are apparently the least of his concerns.